Any kind of comedy has to simultaneously sustain two aspects: the overarching story of the characters, and the jokes that punctuate said story. If either one of these aspects becomes unconvincing or unappealing, it is very hard for the other one to pick up the slack and see us through to the credits. A film can have the funniest jokes in the world, but it's all for nothing if we hate the characters; likewise it can have great characters and a fascinating story, but if the humour isn't well-crafted, then all is lost. With We're The Millers, we find ourselves with a half-decent premise swiftly run into the ground, by a combination of mediocre direction, weak scripting and poor characterisation. It's a film which shows how depressing and exhausting the road movie can be when it's done poorly, and how lazy Hollywood has become in assembling funny stories. While it isn't an unmitigated disaster - at least not by the standards of 1941 - it's still a deeply disappointing and downright hollow experience. I've said many times in my reviews that many of the best films in any genre use their premise to create subtext, almost to the point where the superficial plot is no longer the most relevant or appealing aspect. In the same way as The Red Shoes is not really about ballet, Blade Runner is not really about the future and Gladiator is not really about Rome. Each of these films are enhanced by them deliberarely causing us to second-guess their intentions, and the same principle applies to road movies. Truly great road movies all use their familiar structure to explore some deeper truth or set of ideas. The Adventures of Priscilla, Queen of the Desert begins with three drag queens in a bus heading across Australia, but quickly turns into a heartwarming paean to middle age and gender identity. Finding Nemo starts out as a father searching for his son, and then transitions into a story about risk and responsibility. The same principle applies to both arthouse offerings like Kings of the Road and mainstream favourites like Planes, Trains and Automobiles - but sadly, not to We're The Millers. The premise of We're The Millers is a reasonably appealing one - namely a group of strangers who have to pass off as a family while smuggling drugs, and who eventually come to think of themselves as a family. It's somewhere between the sentimentality of John Hughes and the edgier comedy of early National Lampoon efforts like Animal House. In the hands of someone like John Landis or a younger Harold Ramis, it would have had at least half a chance of working well. Unfortunately, this premise very quickly runs out of steam by bringing nothing new to the table. Much like the high concept films pioneered by Don Simpson and Jerry Bruckheimer, it quickly becomes clear that the bare-bones concept is the start and end of the story. Once we have accepted the general shtick, the film brings nothing new to its genre, and very quickly grows tiresome through the grating nature of its characters. One of the most annoying aspects of the film is the way that the characters frequently talk over each other without adding anything constructive to the plot or a particular conversation. There are several occasions when the family has to fabricate a story to justify what they're doing and why, and rather than collaborate the four members just begin spouting dialogue that has clearly and indulgently been improvised. It might seem like a minor quibble, but it does betray a big weakness in the direction. In my review of Beverly Hills Cop, I spoke about how director Martin Brest allowed Eddie Murphy to improvise most of his dialogue because he was aware of how poor the script really was. The result was that the plot became convoluted and inconsequential, with both the pace and flow being reduced. After each scene where Axel Foley made something stuff up to cover his tracks, the camera just hung for ages on the other characters, to see if they would say anything funny. Looking at We're The Millers, it's clear that director Rawson Marshall Thurber has similarly indulged his cast. He's been perfectly competent in the past, having got a good performance out of Vince Vaughn in the solid comedy Dodgeball: A True Underdog Story. But here, he is content to let his cast ad lib without directing them to interact; when the characters are ad libbing over each other, there's no cohesion or focus. For all the odd lines which are funny or bizarre, these scenes feel like four episodes of Whose Line Is It Anyway? running side by side. 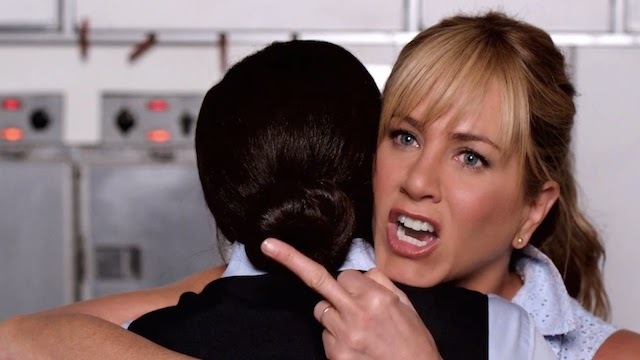 On top of its direction, We're The Millers is surprisingly mean-spirited. It suffers from the same basic problem as Sightseers, namely expecting us to like thoroughly unlikeable people without much by way of redemption or justification. But where Sightseers was merely incompetent, We're The Millers seems to take delight in human misery as an end or source of humour in itself; it doesn't use pain or suffering to deepen the characters, it simply offers it as a benchmark of modern comedy. Like Beverly Hills Cop and its first sequel, the film also has an uncomfortable sleaziness to it. To a certain extent this is symptomatic of modern blockbusters in general, which Simpson and Bruckheimer had a fair amount of influence in shaping. But the scene where Jennifer Aniston does a striptease for a drug baron is not only unsexy, it's desperately leering. Quite apart from the lazy joke of getting Aniston to do it, its only purpose is base tittilation, right down to its needless nod to Flashdance. 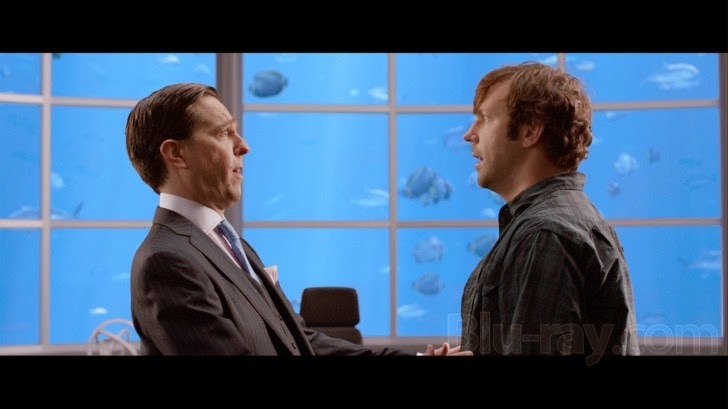 What We're The Millers appears to be, therefore, is a lazy, shambling, unfunny failure. I once described Evil Dead 3 (a.k.a. Army of Darkness) as "the cinematic equivalent of wheelspin", and this film does clearly go in circles until its audience is exhausted. But it does have a couple of saving graces which, while not redeeming it, do make it a more bearable or forgettable experience than Sam Raimi's film. The first such saving grace is Will Poulter. Having first broken onto our screens in the British gem Son of Rambow, Poulter has been quietly building himself quite a reputation. His performance as Eustace was the best thing about The Chronicles of Narnia: The Voyage of the Dawn Treader, and he does have screen presence which will increase as he takes more roles. While he gets less to work with here than in the past, he is the most likeable of the characters by quite some distance. The other plus to We're The Millers is its cinematography. Barry Petersen previously shot Zoolander and the film version of Starsky and Hutch, along with the recent adaptations of 21 Jump Street. He does have a knack of bringing a period feel to comedy films, which in better hands would have made the conceit feel more welcoming and believable. His compositions are generally good and his choice of colours is often far more inviting than the people he is photographing. We're The Millers is a missed opportunity which retreads old ground and brings nothing new to the table aside from unwanted mean-spiritedness. Whille the cast clearly enjoyed making it, Thurber cannot rein them in sufficiently for their improvisations to add to the script, and he does make the very least of the central conceit. It will take a lot more effort on everyone's part to persuade us to take another trip with this family.